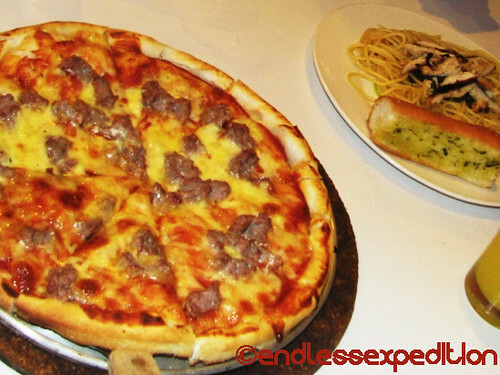 Pizza Volante is a 24-hour Italian Style Pizza Parlor, located at 82 Session Road strip in the Summer Capital of the Philippines, Baguio City. It is probably the most famous Original Pizza Parlor in the Whole City. This two story Restaurant offers a wide range of Italian dishes mainly their Pizza, Pasta and many more that will truly satisfy your Italian Cravings. Even with a small budget of 300 - 500 Pesos, foodies like me could really enjoy surprising dishes that will surely make you smile while you eat. Some of their Best-selling specialties are the Pizza Hannah or Hannah Pizza, Pasta Puttanesca and their Pesto Pasta with Grilled Chicken. 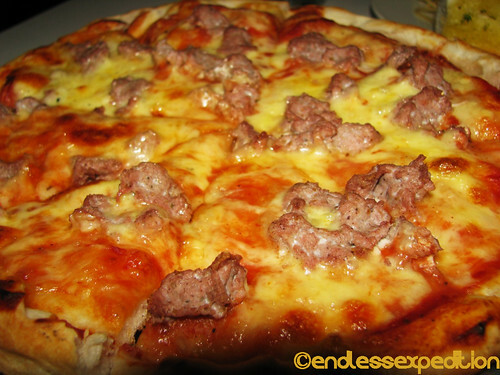 Their Original Recipe Pizza Hannah is made up of Tasty Italian Sausages, Fresh Tomato Sauce, Succulent Mozzarella Cheese and with all the Italian Seasonings. Their Tasty Pesto Pasta is topped with Savory Grilled Chicken that truly goes well with the Basil Base. It is best to have this dishes with a cold Beer but for non-drinkers like me, Pineapple Juice is the Best Partner! It is Best to dine during the evening so you can feel the Restaurants' whole Italian Bistro Ambiance that would surely make your dining experience Molto Fantastico! The place is really conducive and very accommodating for conversations with friends and family. Also, I would like to commend their fast and friendly staff that makes Pizza Volante truly a success. Steven Holding a hot pan of Pizza Hannah. Mangiate Bene!